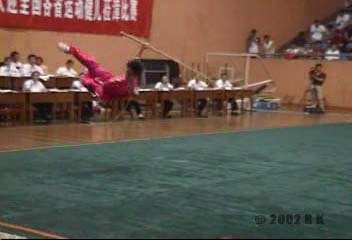 The 2002 China Nationals were held in September 2002 in Fujian Provinvce. 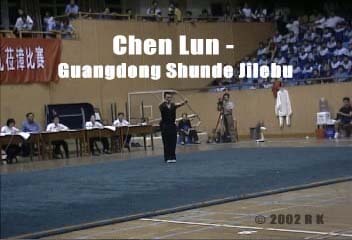 Due to the success of the 2001 All China Games VCDs I decided to release another set of VCDs for this competition. Many of the famous names that competed in the All China Games have retired, so there are a lot of new talent on these discs, as well as many returning favorites. This year's event is the annual championship to name the top ranking male and female athletes from top level teams throughout China. Unlike the All-China Games, that means not just provincial teams, but also from top sports institutes (eg Beijing University of Physical Education, Shanghai Tiyu Xueyan, etc). 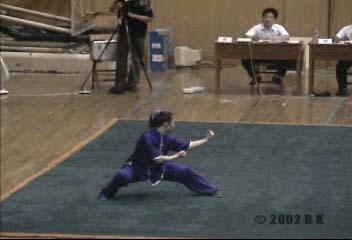 There also are no compulsory routines, only individual, and most importantly, the events for competition include things like other emptyhand (animal styles, other internal styles, etc) and other weapons (other single, double and flexible weapons). 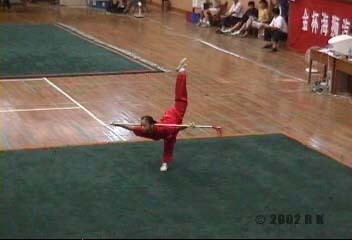 There have been many changes instituted in the competition format for 2002. 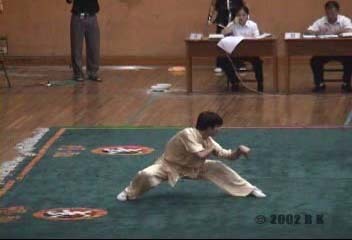 Many of the rules we recognize from international competition are gone, also the required movements for each division have changed since 2001. The changes in Nanquan are particularly controversal. Volume 4: Other Emptyhand (Classes 1,2,3) - Sold Out! 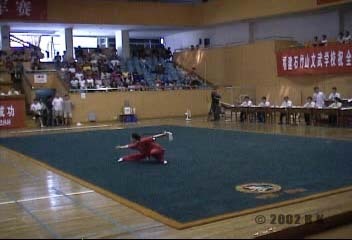 Each competitor competes in either individual changquan or individual nanquan. 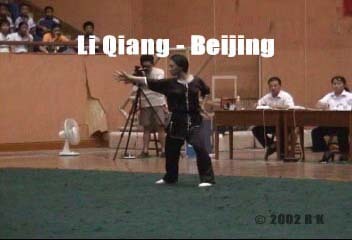 Women's Nanquan: Li Qiang - Beijing, Luo Hao - Tianjin, Zhang Li - Jiangsu, Mao Yaqi - Zhejiang, Wang Rui - Jilin, Shu Li - Hubei, Chen Yanping - Guangdong, Wang Lin - Guangdong, Huang Yanhui - Fujian, Jing Fang - Hebei. 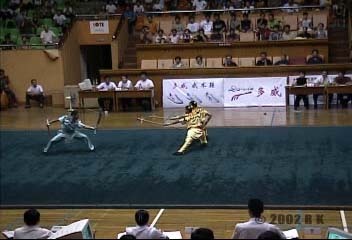 Men's and Women's Broadsword and Men's and Women's Straightsword. 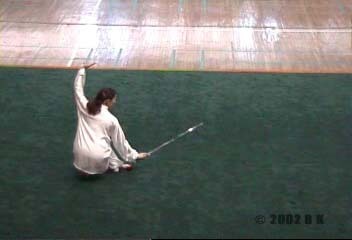 Each competitor competes in either individual broadsword or individual straightsword. Men's and Women's Staff and Men's and Women's Spear. 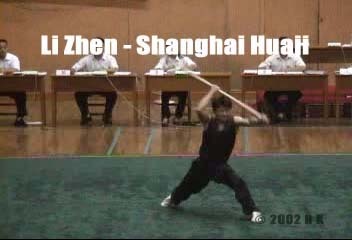 Each competitor competes in either individual staff or individual spear. Volume 4: Other Emptyhand: - This volume is SOLD OUT until further notice! Other Emptyhand is divided into three seperate divisions, On this disc we have all three Women's divisions and two of the Men's. Women's Class 1 (Baguazhang, Xingyi, Bajiquan): Zhejiang - Chen Min, Beijing Tiyu Daxue - Tao Ruifen, Zhejiang - Yu Junling, Anhui - She Fang, Jilin - Liu Xueyan, Jiangxi - Huang Qin, Beijing - Li Qiang, Beijing - Fu Yang, Shanghai Huaji - Chen Bei, Hebei - Fu Lina. 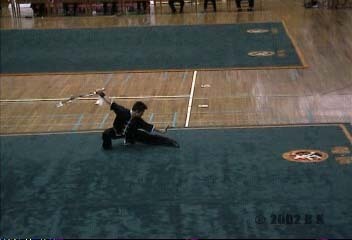 Men's and Women's Other Weapons (Single, Double and Flexible Weapons). Other Weapons is divided into three seperate divisions, On this disc we have two of Women's divisions and all three of the Men's. 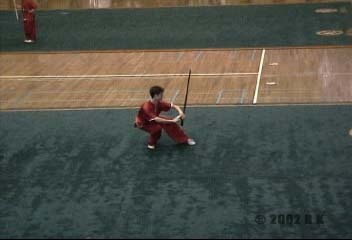 NOTE: The Taiji Sword competitors in the Single Weapons category appear on Volume 6. 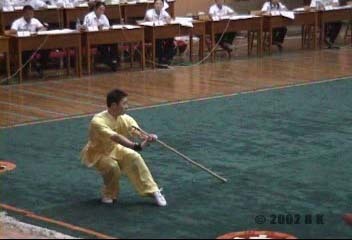 Men's and Women's Taijiquan and Men's and Women's Taiji Sword. 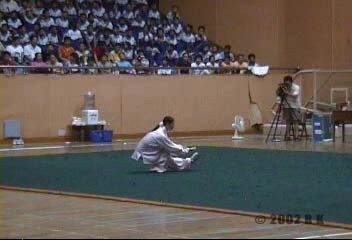 Each competitor competes in either taijiquan and/or taiji sword. 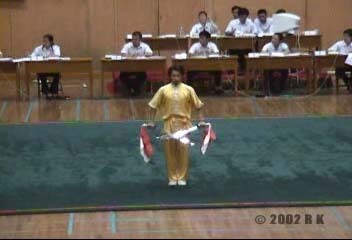 NOTE - Taiji Sword competitors presented here are from the Other Weapons Single Weapons division. Men's and Women's Sparring Sets. 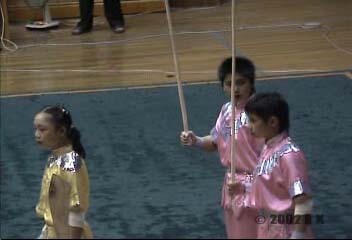 Each group is two to three athletes performing a choreographed fighting routine, either emptyhand or with weapons. 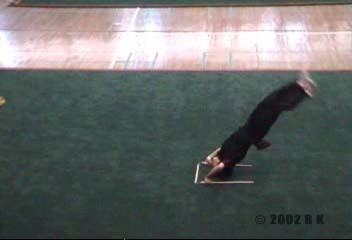 This volume also contains footage of the athletes warmup session. If you're also interested in 2001 All China Games VCDs, click here (you can save on shipping by ordering them together). Is this a professional production? No, meaning you get a little unsteady camera work, voices in the background, etc. But as you can see from the clips and stills above, the quality is pretty good and the editing and titles are better than you'll find on many 'professional' videos on sale. 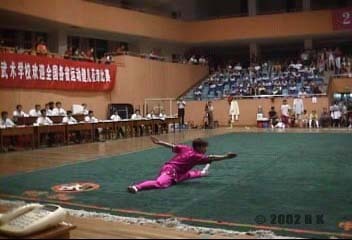 Is this product related to the Beijing Wushu Team? No, although I am a big fan, to the point where I have created the 'beijingwushuteam.com' website, this product is not related to the team. 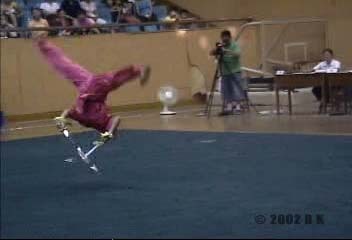 As I am a fan, I tended to get more footage of the Beijing Wushu Team athletes as they competed, so the videos do in some cases feature them during scoring and when on deck for competing. 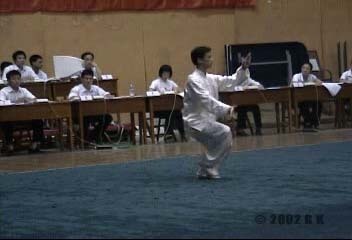 2) These VCDs actually have titles and results in English, so unlike most wushu tapes, you actually know who the athletes are, what team they're on and how well they did. 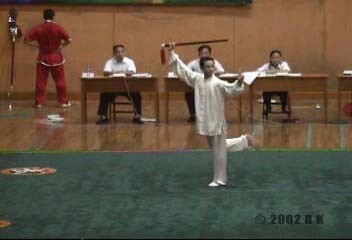 3) Rather then spending hours to download low resolution video clips off the internet you can get an entire CD-ROM worth of great wushu that you can watch on your television for a reasonable price.